Quick start 6 step guide to start reclaiming a Heritage/Paleo-esque way of eating and living. Talk to someone who was alive during the Great Depression and ask them about how they ate growing up and when they first encountered a grocery store as we know it. Bonus points if they will give you any recipes. Extra bonus points if you share. Take 20% of your monthly food budget and devote it to buying from local farmers. Certified Organic is all well and good but if it comes soaked in diesel fuel and trucked 1000 miles it isn’t a step forward. Whole Foods and Sprouts are great but it is a half step, go to the source, find a local farm and ask questions. The bonus for you, you’ll be amazed how far your 20% will go. 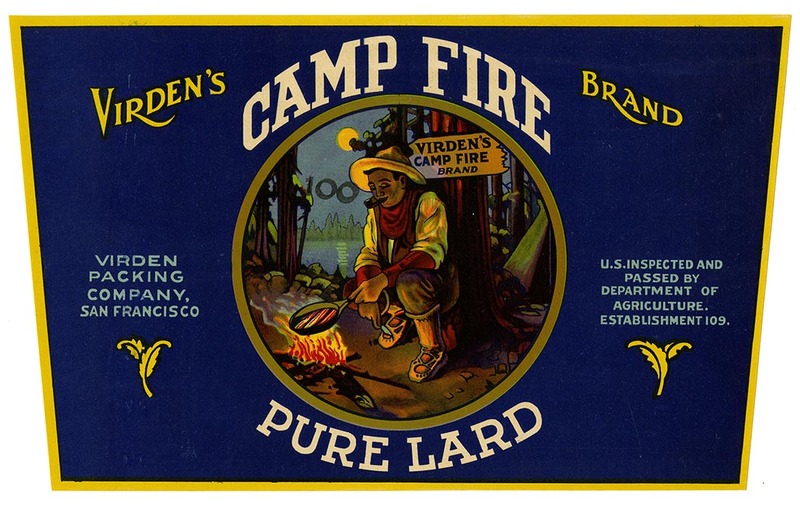 Banish all cooking fats that didn’t exist before 1900 from your life. Camp Fire Lard Label courtesy of the California Historical Society. That includes vegetable oil, Crisco, margarine and Rapeseed, er I mean Canola oil. Use quality animal fats instead; lard, tallow, grass-fed butter, ghee and nut oils like coconut, avocado, walnut and olive oil. Learn when to use each, check out this article from PaleoLeap.com to get you started. Learn what is in season for your area, and try keep your meals centered around those foods or foods you have preserved yourself. Buy an unknown vegetable and figure out what the hell to do with it once you get home. The average American eats less than 11 species of vegetables regularly, out of somewhere around 5,000 edible plant species on the planet, not including cereal grains. Insects; crickets and a few other species have been eaten for thousands of years. There you go, 6 quick steps to get you up and running this afternoon. Remember changing your way of eating and looking at the world is a process. The good you can do today is better than the perfect you can do tomorrow. The important thing is to get started.